The entry-level Aston Martin Vantage is arguably the British marque’s most important car, taking on the mighty Porsche 911. It might not be as sophisticated, but its charm will win you over. The Aston Martin Vantage Coupe is a car that can reduce grown men to child-like finger-pointing and children to shouting out “I want that car” when you pull into a garage. At least that’s what happened on our four-day test drive. And no wonder. 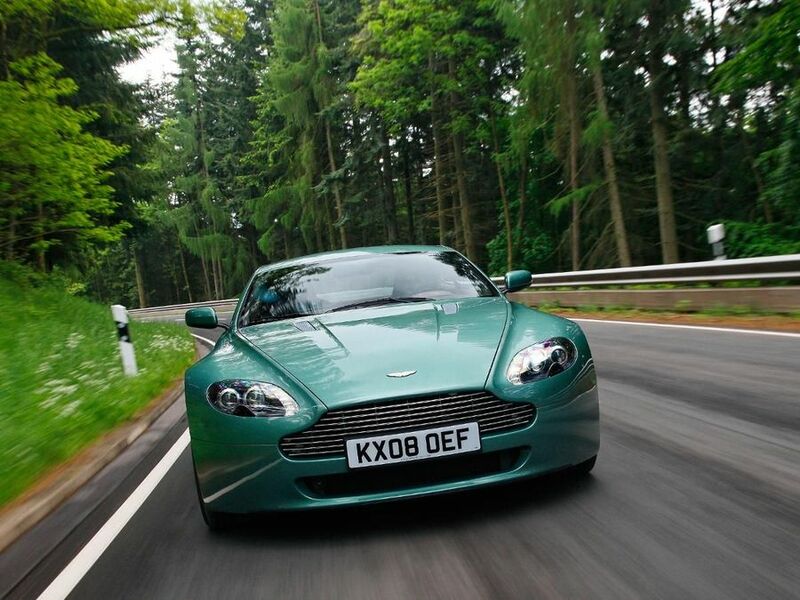 The Aston Martin V8 Vantage is the most beautiful car I have driven. Unlike some of its supercar rivals it also seems to infect everyone who sees it with an overpowering sense of goodwill and approval. It makes you proud to be behind the wheel basking in the admiration for the car and, albeit to a lesser degree, the person who chose to buy it. This is a car as a fully functional and fun work of art. Talking of which… the paintjob alone takes 50 hours to complete and is something even the finest photographers don’t seem able to do justice to. The Vantage exudes craftsmanship and includes aesthetically-pleasing swan wing doors which tilt upwards at a six degree angle with the purpose of helping clear the kerb. Expectations are raised as you step over the door plate which says “Aston Martin V8 Vantage – Hand Made in England” and drop into the super-comfortable Recaro sports seats. These and the dash are covered with five hides (imported from Sweden, where a lack of barb wire fences ensure the leather is unblemished) while the zinc alloy and graphite silver-finished central console features a slot for your super-cool key fob (ECU or Emotion Control Unit). Attention to detail includes the allocation of one machinist per model ensuring each interior is consistent and unique. The switchgear (indicator and windscreen wiper stalks etc…) appear to be from former Ford stablemates but every other inch of the cabin produces the same big fat “Wow!” as the exterior. The metallic-looking analogue dials should come with a health warning that at certain points on your journey you will think you are Roger Moore/Sean Connery/Pierce Brosnan/Daniel Craig or erm… Timothy Dalton. There’s space for jackets behind the front seats, decent door-well space and a pair of cup holders above the central compartment while the contoured 300 litre boot is able to accommodate a fairly generous amount of weekend luggage. We’d say that’s pretty practical for a two-seater sportscar which compromises none of its exterior qualities to create the space. The weight distribution on the top-flight Aston Martin DBS is perfectly balanced with 50 per cent distributed to the front and 50 per cent to the rear. With the front mid-engine Vantage the weight is 49 per cent to the front and 51 per cent to the rear. Spot-welding is eschewed in favour of more solid construction which creates an incredibly stiff aluminium (lighter than steel and doesn’t rust) shell. All this adds up to an extremely composed journey through corners. We drove a sports-pack equipped model with stiffened anti-roll bars, lighter wheels, improved dynamics and better handling capabilities than the regular model. Inevitably this means a firmer ride but not one which seems out of place with the car. The Vantage is powered by a 420bhp V8 4.7-litre normally-aspirated engine. It is a development of the Jaguar-sourced 4.3-litre power train which was used in the first generation Vantage unveiled at the Geneva motor show in 2005 which increases power and performance as well as increasing capacity.This translates to 347Ib/ft pulling power or torque, a 0-60mph time of 4.7 seconds and top speed of 180mph. It’s a car which demands involvement, balancing the clutch taking some concentration (OK, we stalled it a few times) and changes through the six speed gearbox are quite heavy. But it rewards the effort with a superb engine note which bursts into life from 4,000rpm upwards. CO2 emissions of 328g/km place the Vantage in the top car tax bracket. Average fuel consumption is a claimed 21.4mpg – and our figure for four days of road testing was pretty close. The fact Aston Martin only produces 5,000 cars a year and is one of the world’s most desirable marques goes some way to cushion the decline in value or depreciation. The Vantage has only been around for a few years so its reliability is unproven as yet. However it is hand-built and no model receives the wings (Aston Martin’s badge) until it has completed 70 miles of final tests on the road. Aston says it builds quality in (with craftsmen able to halt the production process at any point) rather than rely simply on tests once the car is complete. Aston showed us the car’s safety features when we visited the factory to pick up the car. The front section can collapse in up to three stages to absorb an impact and ensures the cabin rides over the power train should it be shunted backwards with sufficient force. Dual stage driver and passenger airbags are coupled with side airbags. Driver aids come in the shape of Dynamic Stability Control (DSC), Traction Control, Anti-Lock Braking System (ABS), Electronic Brakeforce Distribution (EBD), Emergency Brake Assist (EBA) and positive torque control. You can personalise your Aston Martin to your heart’s content. If the 20 standard colours available don’t float your boat simply bring in a sample of the colour which does, whether that’s your jacket or your wife/partner/Bond girl’s eyes. Aston claims the variety available means you could have a trillion different cars on the road (except of course for the fact that only 5,000 are made each year). Other details you can specify include interior leather colour (ad infinitum again) as well as the thickness of the leather which attaches it to your dash and Recaro seats. Standard features include a full leather interior, automatic temperature control, rear parking sensors and 160W audio system with six-CD autochanger. Options include sat-nav, automated manual transmission, cruise control, memory seats and boot-mounted umbrella, naturally. The model we drove came with the sports pack for the more, erm, enthusiastic driver (features detailed in the Ride and Handling section above). Movie star looks. There are plenty of contenders but ultimately the joy of driving a car which not only put a smile on our faces but those of almost everyone who saw it is this fantastic car’s best feature.